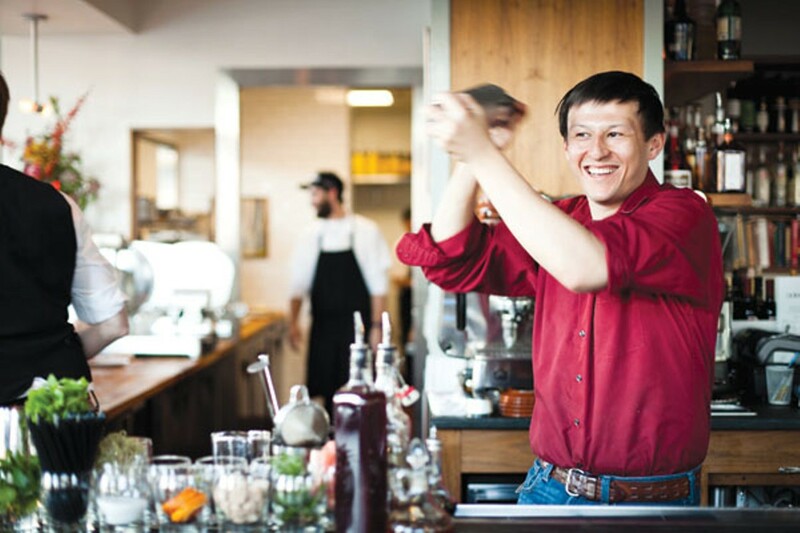 Hanjiro Ambrose makes a drink at Adesso in Oakland. The East Bay's dazzlingly abundant dining options span the globe and the socioeconomic spectrum, offering locals and tourists alike everything from the nationally acclaimed expense-account pleasures of Chez Panisse, to the snacking opportunities along International Boulevard, to the impressive new eateries of Oakland's restaurant renaissance. From among this embarrassment of culinary riches we've chosen eleven eateries that strike a balance between the affordable and the pricey, the popular and the underpublicized, the old and the new. These aren't necessarily the most famous restaurants in the region, but they represent the wide range of choices the East Bay offers, and serve spectacular food to boot. When you're hankering for handcrafted coppa; bresaola; soppressetta; and other lush, spicy, fat-ribboned artisan cold cuts, head to Adesso (4395 Piedmont Ave., Oakland, 510-601-0305, DopoAdesso.com). The forty dazzling varieties of house-cured salumi at this lively Piedmont salumeria/bar/restaurant range from fennel-pollen finocchiana to prosecco-limned sbricciolona, and the place also serves up excellent pâtés, flatbreads, Panini, and gelati. Impressive all-Italian wine list, too. The food at the BoilerHouse Restaurant (1414 Harbour Way South, Richmond, 510-215-6000, BoilerHouseRestaurant.com) is perfectly tasty and satisfying — deluxe American pub grub like Niman Ranch sliders, spicy Cajun shrimp, inventive California-style pizzas. But the best reason to drop in is the setting, a beautifully restored Depression-era factory-deco auto assembly plant. Sawtooth skylights, factory sash windows, silver-painted old boilers, terrazzo tabletops, terracotta flooring, and vintage gears, chains, and pulleys create a unique dining ambience. The East Bay has seen several cutting-edge California-style pizza parlors open over the past year or so, but our favorite is Charlie (Pizzaiola) Hallowell's hangout, located in a rustic old shoe repair storefront. At the aptly named Boot and Shoe Service (3308 Grand Ave., Oakland, 510-763-2668, BootandShoeService.com), his wood-fired pies top light, feathery crusts with house-made sausage, wild nettles, Monterey Bay squid, smoky pancetta, vine-ripened tomatoes, and other delights in beautifully balanced, always intriguing combinations. Tanya Holland's Brown Sugar Kitchen (2534 Mandela Pkwy., Oakland, 510-839-7685, BrownSugarKitchen.com) in West Oakland serves up inventive, organically sourced yet wonderfully satisfying nouvelle soul food in a gleaming deco-moderne setting: crisp cornmeal waffles with juicy fried chicken and warm apple cider syrup; silken hominy grits ribboned with extra-sharp cheddar cheese; house-smoked baby back ribs with pepper-pineapple relish; a fried oyster po' boy worthy of N'Awlins. Don't forget the hot-from-the-skillet cornbread and the gruyere-sweet potato gratin. Breakfast and lunch only. Oakland's favorite Michelin-starred restaurant, Commis (3859 Piedmont Ave., Oakland, 510-653-3902, CommisRestaurant.com), showcases the complex, tongue-tantalizing cuisine of master chef James Syhabout, who turns locally grown, foraged, and harvested organic ingredients into absolutely memorable four-course prix-fixe banquets. Wild borage, pickled shallots, horseradish yogurt, crawfish butter, and absinthe ice cream never tasted so good. Of the half dozen Himalayan eateries in the greater Berkeley area, Everest Cafe (1645 Solano Ave., Berkeley, 510-526-4915, Everest-Cafe.com) is our favorite, a cozy, relaxing getaway fragrant with Nepali cuisine. The spinach-cilantro-mushroom momos, cumin-scented okra stew, spicy goat curry, and spicy, invigorating thukpa (chicken noodle soup) are complemented with equally yummy Indian favorites like chicken, lamb, and seafood tandoor, six varieties of naan bread, and an impressive paella-like biryani. Get the spicy, frothy house chai for dessert. The tantalizing, time-honored cookery of Peru stars at La Furia Chalaca (310 Broadway, Oakland, 510-451-4206, LaFuriaChalaca.com) in Jack London Square. Traditional dishes like causa (potato cakes with spicy chicken and olives), parihuela (fisherman's stew), seco de cabrito (goat shanks with pinto beans), and a velvety sea bass ceviche are presented in colorful, intricate mosaics that reflect the artistry of the cuisine. Intriguing Peruvian wine and beer list. Ippuku (2130 Center St., Berkeley, 510-665-1969, IppukuBerkeley.com), a lively izakaya, brings a panoply of unique tastes and textures to the local Japanese restaurant-going experience. Cutting-edge skewers are the specialty of the house (chicken gizzards, quail, pork belly, et al. ), but don't pass up the bitter melon tempura, Dungeness crab croquettes, and green tea sundae with mochi and tempura flakes. Totally hip underlit raw concrete-recycled wood setting; fantastic 42-variety shochu selection. There's more to the pocket-sized takeout joint, Scolari's Good Eats (1303 Park St., Alameda, 510-521-2400), than burgers and hot dogs. Thin-crusted pizzas, bountiful salads, and New Jersey strombolis (plus seasonal specials like sweet potato empanadas, hush puppies with cayenne butter, sloppy Joe sliders, and whole Dungeness crab with garlic butter) are made on the premises out of organic local ingredients, and they're delicious. (The burgers and hot dogs are awesome, too.) Best of all, it's open till 3 a.m. Thursday through Saturday! Shashamane Bar and Grill (2507 Broadway, Oakland, 510-868-4318, ShashamaneBarandGrill.com) serves Ethiopian cookery at its most spicy and succulent. African art, live music, and a sleek earth-toned color scheme create an attractive setting for rich sambusa turnovers, peppery kitfo (steak tartare), and garlicky gingery goulashes served family style with platter-size wheels of injera bread. The vegetarian menu is impressive, the sweet, floral honey wine even more so. The nondescript Shik Do Rock (1137 Solano Ave., Albany, 510-526-6003) on Solano Avenue serves up several stimulating examples of Korea's lush, bracing cuisine: thick filets of grilled salted mackerel; a hot, snarky stew of beef and kim chi; goon man du (potstickers), haemul pah jun (a frittata-like pancake studded with seafood and scallions); kal gook soo (wheat noodle soup with squid, prawns, and anchovies). Soju, shochu, and sake are available to complement the pickles, peppers, and spices. The Japanese approach to snacker-style dining finds a home in Berkeley. Housed in a former assembly plant on the Richmond waterfront, Boilerhouse offers fine fare with a view. Chef's impressive pedigree pays off at new Oakland restaurant. At Everest Café, celebrate the Year of the Iron Tiger with Himalayan specialities. Discover the cuisine's pan-hemispheric style at La Furia Chalaca. Albany's Shik Do Rock offers family-friendly Korean. Ethiopia's unique, ancient, earthy cuisine blossoms at Shashamane. Brown Sugar Kitchen serves up down-home cooking with a light, contemporary touch.